Faster and more sensitive environmental monitoring should be developed to face the worldwide problem of bacterial infections. To remedy this issue we demonstrate bacteria sensing element, which utilizes dense and ordered layers of bacteriophages specific for given bacteria strain. 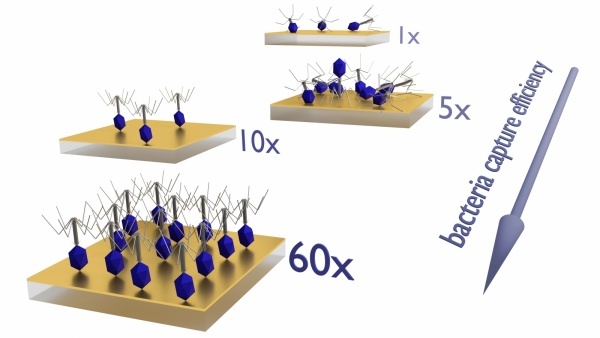 We combine 1) chemical modification of the surface to increase the surface coverage of bacteriophages 2) with alternating electric field to greatly increase the number of properly oriented bacteriophages at the surface. Usually in sensing elements a random orientation of bacteriophages results in steric hindrances, which cause that no more than few percent of all receptors is available. Increased number of properly ordered phages results in optimal performance of phage receptors, what manifests in up to 64-fold increase of sensitivity and limit of detection as low as 100 CFU mL-1. Our sensing elements can be applied for selective, sensitive and fast (15 min) bacteria detection. Well studied pair T4 bacteriophage – Escherichia coli was used as a model, however the method could be adapted to prepare bacteriophage-based sensors for detection of variety of bacterial strains. This document is the Accepted Manuscript version of a Published Work that appeared in final form in ACS Applied Materials & Interfaces, copyright © American Chemical Society after peer review and technical editing by the publisher. To access the final edited and published work see: https://pubs.acs.org/doi/abs/10.1021/acsami.7b03497.